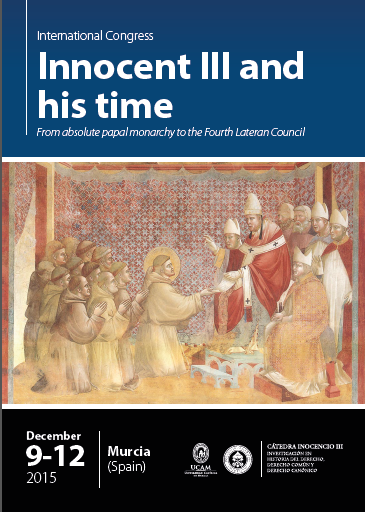 Murcia, Spain, will host an International Congress on ‘Innocent III and his Times’ from December 9-12, 2015. The congress is part of the Joint International Chair of Innocent III, an organization created by Utriusque Juris Institute of the Pontifical Lateran University in Rome and the Catholic University of Murcia, and is aimed at strengthening research initiatives in areas related the History of Law, Common Law and Canon Law. In addition to bringing a number of scholars from around to world to collaborate on research, the project will be creating a jounal named Vergentis. The figure of Innocent III, after centuries, is still of great importance, not only for the historian of canon law, but to any researcher who works on History and Law topics. His decisive contributions to the political and religious situation of the thirteenth century have yet to be revealed in many aspects, so that the period of history can be known with greater accuracy and depth. In addition, this year is the 800th anniversary of two fundamental legal monuments: the Fourth Lateran Council and the English Magna Carta, we intend to enhance research linking both milestones and the decisive influence they had in their time and in the following centuries, and the circumstances that contributed to their relevance. For such purposes, we call on interested researchers to submit papers related to the figure of Innocent III from the standpoint of law in general, Canon Law, Philosophy, Theology, History of Institutions, Roman Law, Comparative Law, Art History, History, Sociology, Historiography and any other discipline.